Finnish orthography is based on the Latin script, and uses an alphabet derived from the Swedish alphabet, officially comprising 29 letters but also has 2 additional letters in some loanwords. The Finnish orthography strives to represent all morphemes phonologically and, roughly speaking, the sound value of each letter tends to correspond with its value in the International Phonetic Alphabet (IPA) – although some discrepancies do exist. Pronunciation as audio. Includes "W" after "V". The following table describes how each letter in the Finnish alphabet (Finnish: Suomen aakkoset) is spelled and pronounced separately. If the name of a consonant begins with a vowel (usually ä [æ]), it can be pronounced and spelled either as a monosyllabic or bisyllabic word. In practice, the names of the letters are rarely spelled, as people usually just type the (uppercase or lowercase) glyph when they want to refer to a particular letter. The pronunciation instructions enclosed in slashes are broad transcriptions based on the IPA system. In notes, more narrow transcriptions are enclosed in square brackets. B, b bee /beː/ Occurs in relatively new loanwords, such as banaani 'banana' and bussi 'bus'. Typically pronounced as [b̥] or [p]. C, c see /seː/ Occurs in unestablished loanwords, such as curry and cesium. Typically pronounced as [k] or [s]. D, d dee /deː/ In present standard language, d stands for [d], but it may be pronounced as [d̥] or [t̪], and the pronunciation in dialects varies greatly. Natively used in Western dialects as [ɾ] and not at all in Eastern dialects. E, e ee /eː/ The precise pronunciation tends to be between [e] and [ɛ]. F, f äf, äffä /æf/, /ˈæf.fæ/, occasionally /ef/ Occurs in relatively new loanwords, such as asfaltti 'asphalt' or uniformu 'uniform'. Historically and in dialectal pronunciation (apart from some Western dialects), /f/ is typically replaced with /ʋ/ or medially /hʋ/ (e.g. kahvi /ˈkah.ʋi/ ← Swedish kaffe 'coffee'). Even newer loanwords may have an alternative spelling where v has replaced f (asvaltti, univormu). G, g gee /ɡeː/ Occurs natively in the digraph ng, which marks the long velar nasal [ŋː] (with no [ɡ] sound). Otherwise g only occurs in relatively new loanwords, such as gaala 'gala' and geeni 'gene'. Typically pronounced [ɡ̊] or [k]. H, h hoo /ɦoː/ Normally a voiceless fricative, but the precise pronunciation depends on the preceding vowel; between two vowels may be pronounced as breathy-voiced [ɦ]. J, j jii /jiː/ Without exception [j] (English consonant y), as in German and Swedish, never fricative or affricate as in French or English. O, o oo /oː/ The precise pronunciation tends to be between [o] and [ɔ]. Q, q kuu /kuː/ Mainly occurs in foreign proper names (in loanwords digraph qu has often been replaced with kv). Typically pronounced as [k], though some speakers mispronounce it as [ɡ]. T, t tee /teː/ The precise pronunciation tends to be dental [t̪] rather than alveolar [t]. U, u uu /uː/ The precise pronunciation tends to be between [u] and [o]. V, v vee /ʋeː/ Typically pronounced as approximant [ʋ] rather than fricative [v]. /ˈtup.lɑˌʋeː/ The "double-v" may occur natively as an archaic variant of v, but otherwise in unestablished loanwords and foreign proper names only. It occurs in some rare surnames such as Waltari (e.g. Mika Waltari, a world-famous author) or in some rare first names such as Werner (e.g. Werner Söderström, a well-known publisher). In collation the letter w is treated like v. Typically pronounced [ʋ]. X, x äks, äksä /æks/, /ˈæk.sæ/, occasionally /eks/ Occurs in unestablished loanwords, such as taxi or fax, but there is often a preferred alternative where x has been replaced with digraph ks (taksi, faksi). Typically pronounced as [ks]. Y, y yy /yː/ The precise pronunciation tends to be between [y] and [ø]. Z, z tset, tseta /tset/, /ˈtse.tɑ/, /zet/, /ˈze.tɑ/ Occurs in unestablished loanwords, such as zeniitti /tse.niːt.ti/ 'zenith' or pizza, but there may be an alternative spelling with ts (e.g. pitsa). Typically pronounced [ts] (like in German), but sometimes as [dz] or [z]. Å, å ruotsalainen oo /oː/, /ˈruot.sɑˌlɑi.nen oː/ The "Swedish o", carried over from the Swedish alphabet and redundant in Finnish; retained especially for writing Finland-Swedish proper names (such as Ståhlberg). Pronounced as [o]. All Finnish words containing å are names; there it is pronounced [oː] (identically to oo). Ö, ö öö /øː/ The precise pronunciation tends to be between [ø] and [œ]. In addition, w is sometimes listed separately and after v, although officially it is merely a variant of the latter and can be alphabetized as v. Similarly, š and ž are variants of s and z, but they are often overlooked, as they are only used in some relatively new loanwords and foreign names, and may be replaced with sh and zh, respectively, if it is technically impossible to reproduce š and ž. The Finnish keyboard layout does not include š or ž; thus, in practice, only highly formal sources such as official texts, encyclopedias or Helsingin Sanomat use them. /ˈsuhu.æssæ/ The "s with caron" is a rare variant of s. It occurred in some relatively new loanwords, such as šakki 'chess' and šillinki 'shilling', but is often replaced with digraph sh (šampoo → shampoo) or, in more established loanwords, with plain s (sampoo). In theory pronounced as [ʃ] but in practice often as [s]. /ˈhat.tuˌtse.tɑ/ The "z with caron" is a rare variant of z. It occurs in some unestablished loanwords, such as džonkki 'junk', and foreign proper names, but is often replaced with digraph zh. In theory pronounced as [ʒ] but the actual pronunciation may vary. 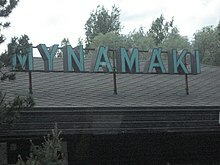 The sign at the bus station of the Finnish town Mynämäki, illustrating a variation of the letter Ä. The main peculiarities in the Finnish alphabet are the two extra vowel letters ä and ö (accompanied by the Swedish å, which is actually not needed for writing Finnish). In Finnish, these extra letters are collectively referred to as the ääkköset when they need to be distinguished from the ISO basic Latin alphabet; the word is a somewhat playful modification of aakkoset, which is the Finnish for the alphabet as a whole. Another informal term is skandit or skandimerkit, which is short for skandinaaviset merkit "Scandinavian characters" (however, the Danish and Norwegian variants æ and ø are usually not taken into account). In Finnish, the letters ä, ö and y are the "front vowel" counterparts to the "back vowel" letters a, o and u — grammatical endings and word suffixes using these letters will use either the front or back form depending on the vowel harmony of the word they are affixed to. The glyphs for ä and ö are derived from the similar looking German umlauted letters, but as with y versus u, they are considered letters in their own right and thus alphabetized separately (after z). The Germanic umlaut or convention of considering digraph ae equivalent to ä, and oe equivalent to ö is inapplicable in Finnish. Moreover, in Finnish, both ae and oe are vowel sequences, not single letters, and they have independent meanings (e.g. haen "I seek" vs. hän "he, she"). In handwritten text, the actual form of the extra marking may vary from a pair of dots to a pair of short vertical bars, to a single horizontal bar, or to a wavy line resembling a tilde. In practice, almost any diacritic situated above the base glyph (for example, á ā ã) would probably be interpreted as a carelessly written pair of dots (ä). However, in computerized character sets, these alternatives are incorrect. The front-vowel counterpart of u using the glyph y rather than ü is carried over from Swedish, and additionally avoids confusion in cursive script with ii, which is common in Finnish. Ålandsbanken 'Bank of Åland' uses a stylized letter Å in its logotype. In the Finnish writing system, some basic Latin letters are considered redundant, and other letters generally represent sounds that are not inherent in the Finnish language. Thus, they are not used in established Finnish words, but they may occur in newer loanwords as well as in foreign proper names, and they are included in the Finnish alphabet in order to maintain interlingual compatibility. The pronunciation of these letters varies quite a lot. The redundant letters are often replaced with more common alternatives in Finnish, except in proper names. They include c (which may be replaced with either k or s), q (which is usually replaced with k, and particularly qu with kv), and x (which is replaced with ks). In addition, the Swedish å is redundant from the Finnish point of view, as its pronunciation is more or less equivalent to the Finnish way of pronouncing o. It is officially included in the Finnish alphabet so that keyboards etc. would be compatible with Swedish, which is one of the two official languages in Finland, as well as for the reproduction of Swedish proper names, which are quite common in Finland, even as surnames of monolingual speakers of Finnish. The letters representing foreign sounds can be found in relatively new loanwords, but in more established loanwords they have been replaced with alternatives that better reflect the typical Finnish pronunciation, e.g. kahvi 'coffee', parta 'beard'. The letters include b, f, and g (which is also used to mark the inherent velar nasal [ŋ], however). From a historical point of view, even d could be said to belong to this group, but the [d] sound has long been an established part of standard language. The letters w and z could be classified into both of the aforementioned groups. The [w] sound is not regarded as a phoneme in Finnish, but historically w was used to mark [v] (or, rather, [ʋ]), as in Dutch, German or Polish. Although this is today considered archaic and v is used instead, w may still occur in some old surnames as a variant of v. Occasionally this can also be applied for faux-archaic effect, as in Wanha Satama "Ye Olde Harbour". Likewise, the z is not native to Finnish, but z (or tz) was formerly used to denote [ts] (as in German). It is still often pronounced [ts], but its pronunciation varies greatly: some speakers may pronounce it [z], or sometimes [tʃ]. The letters š [ʃ] and ž [ʒ] (s and z with caron) are officially recommended instead of sh and zh for transliteration from another alphabet, although in practice, sh and zh are often used. For example, Russian Бре́жнев (transcribed Brezhnev in English) is transliterated Brežnev. However, these sounds are foreign to the Finnish language, the letters do not appear on Finnish keyboards and their pronunciation is not consistent. The [ʃ] sound is familiar to most Finnish speakers and quite commonly used in many loanwords, e.g. šakki 'chess', shampoo, but [ʒ] is restricted to foreign words only. w is generally regarded equivalent to v (in a multilingual context it may, however, be collated separately after v, as in English). Danish and Norwegian ø, Estonian õ and Hungarian ő are alphabetized as ö, not as o. The standard does not specify how one should alphabetize the letter ü when used in other languages than German, but at least as regards the Estonian or Hungarian ü, it seems consistent to treat it as equivalent to y (and even more so, since ü in Estonian and Hungarian is not considered a mere variant of u, as it is in German). It would seem problematic, however, to apply the same principle to e.g. ü (u-diaeresis) as used in Spanish or õ (nasal vowel) as used in Portuguese, as these letters represent quite different orthographic traditions. Polish ł (l with stroke) is alphabetized as l.
ß is alphabetized as ss. Letters and characters taken from other alphabets (e.g. Σ 'Greek capital letter sigma') or writing systems are collated after Latin letters. When writing Finnish, the foundational principle is that each letter stands for one sound and each sound is always represented by the same letter, within the bounds of a single morpheme. The most notable exception to this rule is the velar nasal [ŋ], which does not have an allotted letter. In Finnish, both vowels and consonants may be either short or long. A short sound is written with a single letter, and a long sound is written with a double letter (digraph). It is necessary to recognize the difference between such words as tuli /ˈtu.li/ 'fire', tuuli /ˈtuː.li/ 'wind' and tulli /ˈtul.li/ 'customs' In syllabification, a long consonant is always regarded as having a syllable break in the middle (as in /ˈtɑp.pɑː/), but a long vowel (or a diphthong) is regarded as a single unit that functions as the nucleus of a syllable. Either a long or short vowel may occur in a stressed as well as unstressed syllable. The phonetic quality of a vowel remains the same regardless of whether the vowel is long or short, or whether it is stressed or unstressed. The velar nasal /ŋ/ (generally referred to as äng-äänne 'the eng sound') does not have a letter of its own. Natively, a short /ŋ/ only occurs before /k/, and it is simply written with n, as in kenkä /ˈkeŋ.kæ/ 'shoe'. Since the alveolar nasal /n/ can not occur in such a position, /ŋ/ can be seen as an allophone of /n/. However, if the /k/ is weakened (because of a phenomenon called consonant gradation that occurs when the word is inflected), the result is a long, or geminated, velar nasal /ŋː/ that is written with digraph ng, as in kengät /ˈkeŋ.ŋæt/ 'shoes'. The geminated /ŋː/ is not an allophone of geminated /nː/, since minimal pairs do exist: kangas /ˈkɑŋ.ŋɑs/ 'textile' vs. kannas /ˈkɑn.nɑs/ 'isthmus'. The treatment of the velar nasal in loanwords is highly inconsistent, often mixing the original spelling of the word with an applied Finnish pronunciation pattern. Englanti 'England' is pronounced /ˈeŋ.lɑn.ti/ (with a short /ŋ/ but no /ɡ/), and even magneetti 'magnet' is pronounced /ˈmɑŋ.neːt.ti/ (with plain g being pronounced as /ŋ/ when followed by n, as in classical Latin) – cf. a more specialized term diagnoosi /di.aɡ.noː.si/ 'diagnosis', and in a word-initial position gnuu /ɡnuː/ 'gnu'. Following the typical Finnish pronunciation pattern, kongestio 'congestion' is often pronounced /ˈkoŋ.ŋes.ti.o/, but /ˈkoŋ.ɡes.ti.o/ may also occur. Traditionally, /b/ and /ɡ/ are not counted as Finnish phonemes, since they only appear in loanwords. However, these borrowings being relatively common, they are nowadays considered part of the educated norm. The failure to use them correctly is sometimes ridiculed, e.g. if a news reporter or a high official consistently and publicly pronounces Belgia 'Belgium' as /ˈpel.ki.a/. Even many educated speakers, however, still make no distinction between voiced and voiceless plosives in regular speech, although minimal pairs exist: /ˈbus.si/ 'bus' vs. /ˈpus.si/ 'bag', /ˈɡo.ril.lɑ/ 'gorilla' vs. /ˈko.ril.lɑ/ 'with/at a basket'. The status of /d/ is somewhat different from /b/ and /ɡ/, since it appears in native Finnish words, too, as a regular "weak" correspondence of the voiceless /t/ (as a result of consonant gradation), and even in the infinitives of many verbs, such as syödä, "to eat". At the time when Mikael Agricola, the "father" of literary Finnish, devised a system for writing the language, this sound still had the value of the voiced dental fricative /ð/, as in English "then". Since neither Swedish nor German of that time had a separate sign for this sound, Agricola chose to mark it with d or dh. In the middle of the 19th century, a significant portion of the Swedish-speaking upper class in Finland decided that Finnish had to be made equal in usage to Swedish. They even started using Finnish as their home language, even while very few of them really mastered it well. Since the historical */ð/ no more had a common way of pronunciation between different Finnish dialects and since it was usually written as d, many started using the Swedish pronunciation [d], which eventually became the educated norm. Initially, few native speakers of Finnish acquired the foreign plosive realisation of the native phoneme. Still some decades ago it was not entirely exceptional to hear loanwords like deodorantti 'deodorant' pronounced as /teotorantti/, while native Finnish words with a /d/ were pronounced in the usual dialectal way. Nowadays, the Finnish language spoken by native Swedish speakers is not anymore considered paradigmatic, but as a result of their long-lasting prestige, many people particularly in the capital district acquired the new [d] sound. Due to diffusion of the standard language through mass media and basic education, and due to the dialectal prestige of the capital area, the plosive [d] can now be heard in all parts of the country, at least in loanwords and in formal speech. Nowadays replacing /d/ with a /t/ is considered rustic, for example /nyt tarvittais uutta tirektiiviä/ instead of /nyt tarvittaisiin uutta direktiiviä/ 'now we could use a new directive'. Väinö Linna uses d as a hallmark of unpleasant command language in the novel The Unknown Soldier. Lieutenant Lammio was a native Helsinkian, and his language was considered haughty upper-class speech. On the other hand, private Asumaniemi's (another native Helsinkian) d raised no irritation, as he spoke Helsinki slang as his everyday speech. In Helsinki slang, the slang used by some, more rarely nowadays, in Helsinki, the voiced stops are found in native words even in positions which are not the result of consonant gradation, e.g. /dallas/ 's/he walked' (← native verb root talla-), /bonjata/ 'to understand' (← Russian /ponʲiˈmatʲ/ понимать). In the Southwestern dialects of Rauma-Eurajoki-Laitila area, /b/, /d/ and /ɡ/ are commonplace, since the voicing of nasals spread to phonemes /p/, /t/ and /k/, making them half-voiced, e.g. /sendä/ ← sentään or /ninɡo/ ← niin kuin. They are also found in those coastal areas where Swedish influenced the speech. ^ Pauli Saukkonen & Anneli Räikkälä, Finnish orthography and the characters š and ž. Research Institute for the Languages of Finland, 1998. ^ This rule is stated in the standard SFS 4900 (Transliteration of Cyrillic characters: Slavic languages), p. 7.